1. Check your name in Complete Draft NRC in printed copies at your designated NRC Seva Kendras (NSKs) from 10.00 AM to 4.00 PM during 30th July 2018 to 28th September 2018 on all working days. i) Pre-register your mobile number by sending an SMS to 7899405444 or 7026321133 or 7026861122 or 9765556555.
ii) If you avail the pre-registration facility you will receive an SMS automatically about the status of inclusion of your name in Complete Draft on 30th July, 2018.
iii) The format of pre-registration is ARN space ARN. For example, if your ARN is 101856721980000087961, then type ARN 101856721980000087961 and send it to 7899405444 or 7026321133 or 7026861122 or 9765556555.
iv) This service is already active and will remain active till 6.00 PM on 29th July 2018 only. 4. 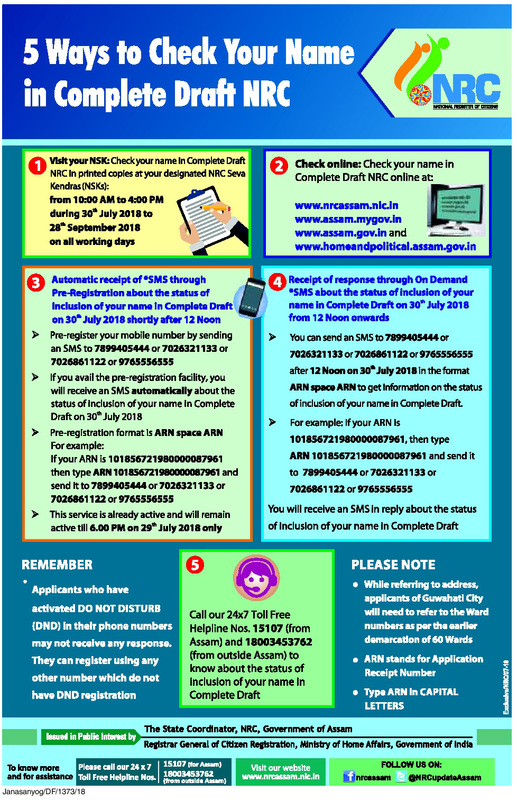 Receipt of response through On Demand SMS about the status of inclusion of your name in Complete Draft on 30th July 2018 from 12 Noon onwards. You can send an SMS to to 7899405444 or 7026321133 or 7026861122 or 9765556555 after 12 Noon on 30th July 2018 in the format ARN space ARN to get information on the status of inclusion of your name in Complete Draft. For Example: If your ARN is 101856721980000087961, then type ARN 101856721980000087961 and send it to 7899405444 or 7026321133 or 7026861122 or 9765556555.. You will receive an SMS in reply about the status of inclusion of your name in Complete Draft. 5. Call 24x7 Toll Free Helpline Nos. 15107 (from Assam) and 18003453762 (from outside Assam) to know about the status of inclusion of your name in Complete Draft. Remember: Applicants who have activated DO NOT DISTURB (DND) in their phone numbers may not receive any response. They can register using any other number which do not have DND registration. i) While referring to address, applicants of Guwahati City will need to refer to the Ward numbers as per the earlier demarcation of 60 Wards. iii) Type ARN in CAPITAL LETTERS. For more information you can download the Official Notification below.